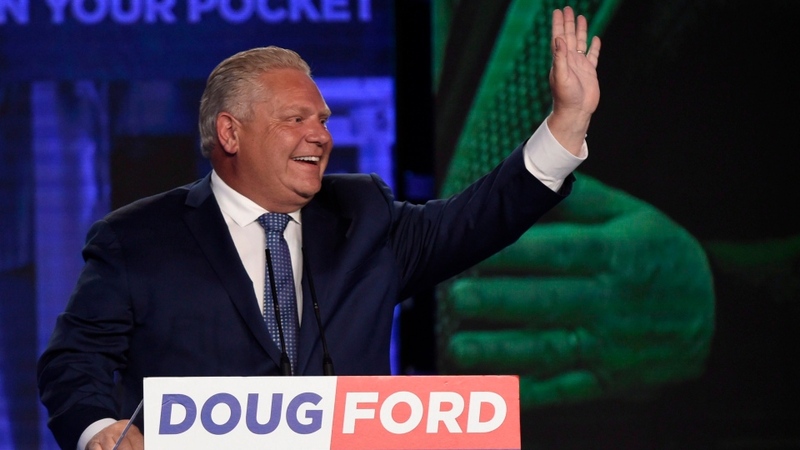 TORONTO -- Progressive Conservative Leader Doug Ford has won the Ontario election and will lead a majority government as the province’s next premier. 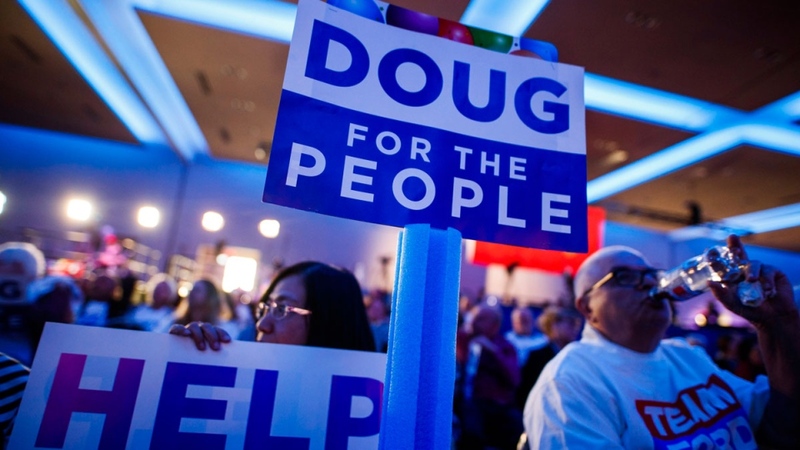 The crowd at the Toronto Congress Centre burst into cheers, waving signs reading “Doug for the people” and “Help is on the way” as CTV projected a clear victory early Thursday night, less than 15 minutes after polls closed at 9 p.m.
Just after midnight, the PCs were elected in 76 ridings, surpassing the 63 seats needed for a majority. The NDP were at 39, the Liberals at seven and the Green Party at one. One riding had yet to report its results. Ford was joined on stage by his family, including his mother, Diane Ford, his wife, Karla, and their four daughters. Blue and white confetti burst from the cannons as the family embraced. It’s a decisive victory for the one-time Toronto city councillor and family businessman who took over the party only three months ago. The last time Ford ran for public office was the 2014 Toronto mayoral election, when he lost to Toronto Mayor John Tory. It also marks a stunning loss for Liberal Leader Kathleen Wynne, who won a majority government in 2014 but slowly watched that support crumble. Wynne had conceded Saturday that she expected to lose the election, but urged her supporters to show up and vote. On Thursday night, she resigned as party leader. The election results are also disappointing for NDP Leader Andrea Horwath, whose support surged in recent polls but did not materialize as much as she hoped on election day. By clinching a majority of the province’s seats, Ford and his slate of PC candidates will take control of Queen’s Park. It’s been 15 years since the party last controlled the legislature. Following the results, Federal Conservative MP Tony Clement offered a word of advice to Ford. “When you get in to power, find those inefficiencies quickly,” he said, referencing the inefficiencies that Ford has said will help pay for his platform promises. Former Mississauga mayor Hazel McCallion, who endorsed Ford ahead of the election, said she was happy with his win. "We need Ontario, the greatest province in the country, back on track," McCallion said, speaking after the victory. 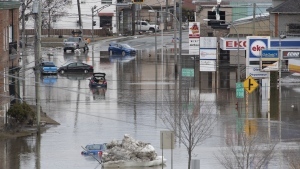 "Province-wide, I felt leaders of both the NDP and the Liberal party were promising far too many things that are going to greatly increase the debt of the province." Prime Minister Justin Trudeau issued a statement Tuesday night, congratulating Ford. “I look forward to working with the new provincial government to create good, middle class jobs, make Ontario a world-leading centre for innovative and sustainable technologies, and build infrastructure that meets the needs of Ontarians,” he said. It was a tumultuous lead-up to election day, with plenty of twists and turns. Ford won the PC leadership seat in March when he eked out a narrow victory over PC MPP Christine Elliott. Toronto lawyer Caroline Mulroney and social conservative advocate Tanya Granic Allen also ran. The vote was called after former PC leader Patrick Brown resigned from the post following allegations of sexual misconduct from two women. Brown calls the allegations false and has since filed an $8-million defamation lawsuit against CTV News, which was first to report on the allegations. CTV News stands by its reporting and will vigorously defend it in court. The campaign trail has been no stranger to controversy. Most recently, Rob Ford’s widow, Renata Ford, accused Doug Ford of mishandling her late husband’s estate and causing financial harm to her family. In a lawsuit filed three days before the election by Renata Ford and her two children, the family alleges that Doug Ford mismanaged the family business and destroyed the value of the family company, Deco Labels, with Randy Ford, another Ford sibling. The lawsuit seeks damages in excess of $15 million from the defendants. Doug Ford called it “heartbreaking” that his brother’s widow launched the lawsuit in the final days of the campaign. Ford said the accusations are “false and without merit,” and expressed concern for his niece and nephew. Two weeks before election day, the Liberals accused Ford of selling bogus party memberships and intimidating a potential candidate for the party. The Liberals released audio recordings that they said proved that Ford and Kinga Surma, a former city staffer under Rob Ford and PC candidate, told potential supporters that they would not have to pay for a party membership. That would violate party rules. The Liberals also accused Ford of intimidating potential PC candidate Pina Martino, interim chief of staff for former PC leader Patrick Brown, by following her home in his vehicle. Ford also faced uncomfortable questions about an alleged data breach linked to his party. PC candidate Simmer Sandhu resigned abruptly in May, a week after he was linked to the alleged breach of data at the 407 ETR toll highway. York Regional Police said they are investigating the case as an “inside theft.” About 60,000 users’ information was compromised in the alleged breach. Ford has distanced himself from the alleged data breach and blamed his predecessor, Patrick Brown. After the news broke, the NDP demanded that Elections Ontario investigation 12 nominations contests for PC candidates. The PCs also engaged in some political mudslinging. The party surfaced a Facebook post allegedly made by an NDP candidate in 2013 that quoted Adolf Hitler. The PCs have also built a website describing NDP candidates as 9/11 truthers, “bigots” and anti-mining activists. Horwath responded to those accusations, calling the Hitler post a “despicable meme.” She also suggested that Ford’s team has been rifling through social media to find dirt on her candidates. "There have been a couple of things that (Progressive Conservative Leader Doug) Ford and his team have decided to go back years and years and years and mine through Facebook," Horwath said last week. "If that's how he wants to spend his time and how his team want to spend their time then they can have at it. What I can tell you is this, my team does not have three on-going police units ... looking into my candidates possibly using stolen information from the 407 to help them get nominated." Ford made plenty of promises along the campaign trail. But he was criticized by his opponents for breaking a promise to release a complete pricing breakdown of how he plans to pay for those initiatives. Throughout the campaign, Ford often distanced himself from other politicians and railed against a culture of political insiders at Queens Park. But the Ford family itself has deep ties to politics, both at the municipal and provincial levels. Ford entered politics in 2010 as a Toronto city councilor alongside his brother, the late mayor Rob Ford. Their father, Doug Ford Sr., served as a PC MPP for an Etobicoke riding for one term in the late 1990s. Ford’s nephew, Michael Ford, is currently a Toronto city councilor. The Ford brothers gained national attention under their tenure in Toronto city hall, and their bumper-sticker political slogans were well known. Ford’s attendance record in city council was also the subject of criticism. In 2014, he missed 54 per cent of city council votes, giving him the third-worst attendance record on council. In 2013, Mayor Rob Ford was accused of appearing in a video smoking what appeared to be crack cocaine. Ford initially denied the allegations, published by the Toronto Star and Gawker. At the height of the crack scandal, the Globe and Mail published a story in which 10 unnamed sources told the newspaper that Doug Ford dealt hashish for several years during the 1980s. In an interview with CTV Toronto at the time, Doug Ford flatly denied the report. Rob Ford later admitted to smoking crack cocaine. The notorious video, which was linked to a case against his friend Sando Lisi, was eventually released to the public in 2016. Doug Ford took over the family business, Deco Labels, in 2002 when he became the company’s president. He’s served as the company’s co-director since 2011 and left management to older brother Randy Ford.